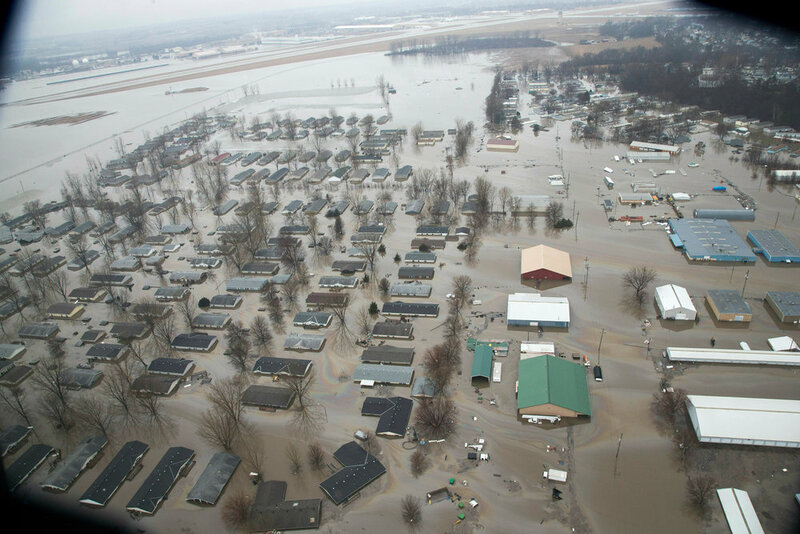 Flooding devastated the central part of the country in mid-March, evacuating towns and killing three in Nebraska, which already faces $1.3 billion in damages from the swelling Missouri River. Other states, like Illinois and South Dakota, are facing evacuations ahead of more floods. In Missouri, the St. Louis area is fearing a repeat of 1993, when historic floods killed 50 people. Since 2011, St. Louis has experienced “once-in-a-lifetime” flood events on three separate occasions. “It was like being in a giant situation room,” says Colin Wellenkamp, the executive director of the Mississippi River Cities and Towns Initiative (MRCTI), a group of 88 mayors from 10 states along the river working to better prepare for flooding, which been hitting the Midwest with more frequency and magnitude in recent years. The group traveled to Washington, D.C., last month to ask the federal government for $7.86 billion to reinforce infrastructure along the Mississippi, and it helped organize the late-March phone call that brought the mayors together with state legislators, the Federal Emergency Management Agency (FEMA), the National Oceanic and Atmospheric Administration (NOAA), the Army Corps of Engineers and more to discuss strategies for what looks to be a disastrous flooding season. Forecasters warn the worst may be yet to come this spring, due to record-setting snowfall in the upper Midwest this winter. While the winter snow melts into the Mississippi River, heavy rainfall in the coming months could create mass flooding. Recent studies have found the chance of 100-year floods along the Mississippi River have increased by 20 percent over the past 500 years. As the Earth warms and its atmosphere becomes wetter because of climate change, extreme rain and snowfall events are more likely. The changing climate is also believed to be causing the jet stream over North America to stretch further south, carrying polar vortex winds down from the Arctic and into the United States, as we experienced in late January — making winters more brutally cold and producing more snow. Preventing the floods that follow may not be so easy, even with better infrastructure, as some experts have also blamed the increased flooding, ironically, on the levees themselves, which they say have straightened and “channelized” the water, thus increasing the flow. But the Army Corp of Engineers has said the existing levees have prevented $100 billion in damage over the years. Climate change has been lost on the Trump administration, however, which has made efforts to remove mention of it from federal websites and resources, moved full steam ahead to facilitate the burning of more fossil fuels, and Trump has continuously mocked the idea of climate change. Wellenkamp says there was no “rebuff” of climate change when speaking with members of Congress, especially at a bipartisan breakfast where Wellenkamp says Sen. Roy Blunt (R-Missouri) and Rep. Abby Finkenauer (D-Iowa) sat next to each other and openly discussed the issue. In his perception of it, Wellenkamp says global warming seems to be an accepted reality among lawmakers, just not in the White House. “It’s of concern that the position of the administration seems to be mired in this hesitance or unconvincability of it all,” he says. “The good news is that in working with Congress, all the solutions are on the table and that’s where we focus our energy,” Wellenkamp says. Influence from the White House is still a roadblock, though. Congress rejected a $13 billion emergency relief plan Monday that would have given aid to states reeling from flood damage along the Missouri River; the Senate rejected the relief package after Trump complained on Twitter about Puerto Rico seeing too much funding from the plan. But Wellenkamp’s Mississippi River Cities and Towns Initiative is hoping for more than just emergency relief for what has seemingly become a chronic issue. In Clarksville, Missouri — about 80 miles north of St. Louis, along the Mississippi River — mayor Jo Anne Smiley tells Rolling Stone that the increased flooding in recent years has had a “devastating impact” on the local economy, with many local businesses sitting about 100 feet from the river. Floodwaters in Clarksville reached 34.2 feet this past weekend, nearly 10 feet above the local flood level. Flooding is feared to get worse, with temperatures across the Midwest expected to be in the mid-70s later this week and two and a half feet of snow left to melt in parts of the Mississippi River Valley. Smiley says the town doesn’t have a permanent floodwall because its economy relies on riverfront tourism. The mayor says she’s asked the state government for a temporary floodwall for over a decade, but to no avail. The MRCTI is hoping to reach a deal with federal lawmakers to allocate $7.86 billion to help reinforce infrastructure that prevents flooding and to better prepare areas along the Mississippi. The request is a small asking price, the group says, compared to the billions in damage Midwestern states along the Mississippi corridor will pay in the coming years. MRCTI says the region has already sustained $50 billion in losses since 2011. As extreme weather linked to climate change continues to cause more flooding the Midwest is expected to pay more than $500 million a year to adapt urban stormwater systems to handle larger volumes of water, and $400 million per year by 2050 to keep bridges functional, according to federal estimates. By the end of the century, annual road maintenance is expected to rise by $6 billion annually with another $1 billion impact on railroad transportation. Despite dismal predictions, Wellenkamp is feeling optimistic because of the growing effort each year to stop the flooding before it starts. The phone call on March 22nd lasted longer than the hour they budgeted for – proof, he says, that there’s an increased awareness and interest in solving the issue. MRCTI leaders like Wellenkamp are also hopeful they’ll get much of the $7.86 billion they requested from the federal government last month and take a bite out of the Midwest’s flood fight. Newer PostMayors: As floods deluge Midwest towns, where is national response to climate disasters?